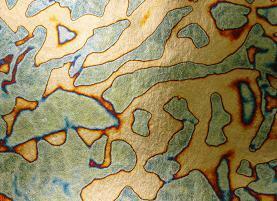 This is a brass leaf which has been treated with chemicals and acids to produce a random coloured pattern on the leaf. The colours are also random, but as a guide, the stated colours indicate a predominance of that colour. Booklets of 25 leaves each measuring 140mm x 140mm.